Juan Rocha, 18, puts a finishing touch on the mural, which he hopes will inspire others to get involved in making the neighborhood better. The overpass on East 29th Street includes portraits of the young artists themselves and is part of an effort to curb taggers in the area. Arreana Robles, 17, stands next to the image she created of herself. 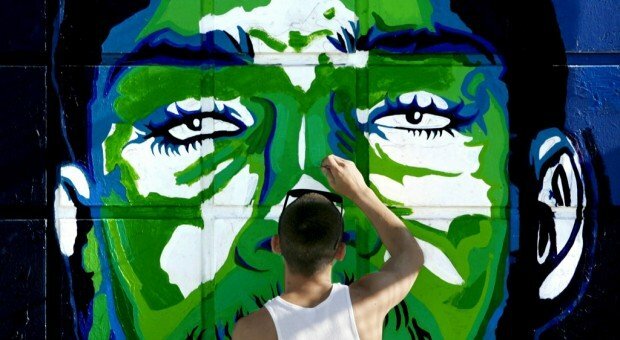 The youths who created the artwork will formally unveil it on Wednesday. For Arreana Robles, it's about creating a cleaner, more beautiful environment in her neighborhood. For Juan Rocha, it's about letting his neighborhood see his artistic talent. However, for the city and surrounding community, it's an opportunity to deter graffiti vandalism and beautify an area previously plagued by taggers and trash. Robles and Rocha, along with dozens of other youths from the Jim and Vicki Click Clubhouse, 1935 S. Columbus Blvd., have spent the last two years creating a mural on the pedestrian overpass next to the clubhouse at East 29th Street and South Columbus Boulevard. The project, "Inside the Overpass," features their faces depicted on the walls of the overpass stairwells on both sides of 29th Street. The Tucson Arts Brigade will officially unveil the mural to the public Wednesday at the overpass. The project was a partnership between the clubhouse, which is part of the Boys and Girls Clubs of Tucson, the Arts Brigade, the Tucson Pima Arts Council and other organizations. The Arts Council, along with the Puffin Foundation, PRO Neighborhoods and Pantano Christian Church, helped pay for the project, which cost about $22,000, said Michael Schwartz, executive director of the Tucson Arts Brigade. The group completed the project at a time when graffiti vandalism has increased dramatically in the city while drawing more attention from Tucson police and neighborhood groups. In 2011, there were about 75,000 tagging incidents reported in the city. There were about 37,000 incidents reported in 2010 and about 9,000 in 2009. The increase forced the Tucson Police Department to devote more officers to investigate the vandalism. Schwartz said the overpass mural was an opportunity for the youths, who are between the ages of 8 and 18, to take ownership of their neighborhood. "We talked to the kids who were doing the graffiti and invited them to be part of the program, and encouraged them to think of this as their overpass," Schwartz said. "This is your place. This is a reflection of who you are." The project began after the 29th Street Corridor Coalition asked the arts brigade to help address the graffiti vandalism and other problems in the neighborhood, he said. The group began by cleaning the graffiti and trash that littered the overpass. More than 70 kids have contributed to the mural throughout the project. "When we came here, this area was saturated. I don't mean one or two tags - I mean hundreds and hundreds and hundreds and hundreds," Schwartz said. The group started by creating a practice mural on the wall of a room in the Jim and Vicki Click Clubhouse before designing the bigger mural for the overpass. After the design was approved, the group members began tracing their faces and other designs on a special material that was installed on the walls of the overpass. Last week, a group of students spent the early evening hours touching up the faces and other designs with paint while preparing for this week's unveiling. Robles' face is depicted on a wall lining the stairs on the north side of the overpass. The mural will hopefully encourage taggers to use their talents in a positive way, she said. "I learned that when a lot of great minds come together, you can create positive pieces of art," said Robles, 17. "Taggers are talented, but they're going the wrong direction." Robles will graduate from Eastpointe High School later this month. She was already involved with the Boys and Girls Club when she volunteered for the mural project. "I figured they needed a role model, to see someone being involved instead of wasting our life," she said, referring to the younger children who volunteered. Rocha, 18, enjoys drawing and relishes the opportunity to share his talent, he said. "I like to be creative. I'm really good at drawing, but I like painting," said Rocha, who expects to receive his GED in June. He hopes the mural will inspire people in the surrounding neighborhood to get involved with projects to improve the area, he said. "I think everyone is going to be watching this mural," he said. 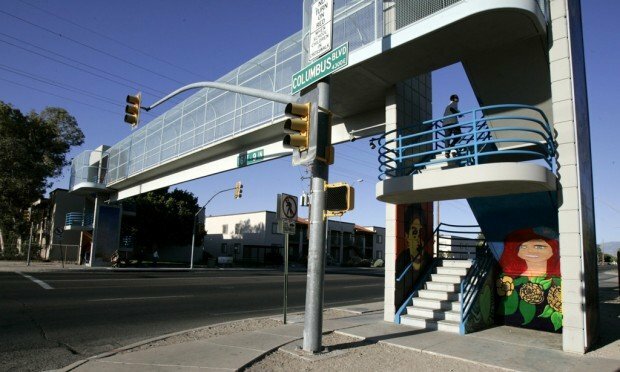 The Tucson Arts Brigade will unveil its mural "Inside the Overpass" from 3:30 to 6:30 p.m. Wednesday at East 29th Street and South Columbus Boulevard, next to the Jim and Vicki Click Clubhouse. The event will feature speakers, live music and food. It is free and open to the public. Young artists paint murals on overpass to curtail tagging.